Silent Sound Spread Spectrum (SSSS) & the All-Digital TV Broadcast Signal: Connection? Ever since first hearing of it last spring, I’ve had a deepening sense of foreboding – an unnamed dread of the upcoming shift to an all-digital television broadcast signal, scheduled to occur in February 2009. Now, I believe, that nameless dread may have a name, after all. The Department of Defense calls it Silent Sound Spread Spectrum (SSSS), and it also goes by the name of S-quad or Squad. In the private sector, the technology goes by the name of Silent Subliminal Presentation System and the technology has also been released to certain corporate vendors who have attached catchy brand names like BrainSpeak Silent Subliminals to their own SSSS-based products. It did not take long for conservatives to once again see the state as their enemy. Bush was so universally disliked by the end of his second term, and the financial collapse and his socialist response were so staggering, that even the right began to buckle in its support for his regime by late last year. The rise of Obama, who hit the ground running with a trillion-dollar spending package and a wish list of leftwing government goodies, has turned most of the right into loud dissenters on domestic policy. But it goes further than criticizing Obama’s management. The right now speaks about government in philosophical terms. Its radio spokesmen say government cannot solve the recession or manage the economy. They sometimes even recommend the economic tracts of Hazlitt and Mises and share airtime with libertarians in mutual horrified protest as the nation moves quickly toward socialism. What’s more, it is personal. The pundits complain about the right being shut out and worry about being shut down. Sean Hannity even said the other day that he worries those who dissent will be punished by the IRS. It is like the 1990s, when conservatives could often sound quite radical and passionate about the threat posed by the Clinton government. It was a danger to our liberty, they seemed to understand. They even sometimes fundamentally questioned federal taxing and such federal policing as was seen at Waco. The mainstream media jumped on this rightwing fear of the state and called it paranoia. Conservatives who feared Clinton’s Brave New World were mocked. The administration’s real victims were ignored. The Oklahoma City bombing was blamed on rightwing uneasiness with big government. The national government was at the time itself a little paranoid. Hillary Clinton was ridiculed when she whined about the vast rightwing conspiracy. One last great moment from the rightwing’s last era of distrusting the state was the confirmation hearing for John Ashcroft. He had said the Second Amendment was meant to protect Americans from tyrannical government. Senator Ted Kennedy found it obscene that anyone would call the U.S. government tyrannical. Then, with Bush freshly in power, 9/11 happened. Bush’s government became much more tyrannical than Clinton’s was. Now it was Ashcroft defending the government and denying it was despotic. And it was Kennedy condemning the power grabs. The left became increasingly critical of the warfare and police state being built by Bush and his crew. Their criticisms were sometimes radical, invoking the traditions of Western law and the U.S. Constitution. Unchecked executive power was a threat to the people’s liberties, most liberals would say. Conservatives, meanwhile, nearly stopped seeing the state as anything but their protector from foreign dangers and even the liberator of all the people it conquered. It could do no wrong. The idea that the U.S. government – the same one whose ATF, FBI and IRS the right feared in the 1990s – could pose a real threat to our liberty became seditious. It was wrong to question the government and president at wartime. The most virtuous U.S. government was categorically incapable of torturing innocents, we were reassured. The conservatives ignored the victims of the state – the bombed innocents; the peaceful protesters assaulted, spied on and blacklisted from commercial flight; the people indefinitely detained without trial. It was absurd to even think the American government would hurt its own people. Now they are sounding paranoid again, distrusting of the national agenda, out of step with the central plan, dubious of the state’s foreign and domestic ambitions. Most of this regards economic policy, but there is a deeper dynamic at play. The right knows how much power was built up under Bush, and it knows that the left now has it all. After eight years of waiting, the left is back and some fear it is payback time. This follows a familiar pattern. One administration punishes its political enemies from the past. Those out of power are called paranoid, whether they were the rightwing peace activists who feared FDR, the leftwing peace activists who feared the House un-American Activities Committee, the conservatives who feared Clinton or the liberals who feared Bush. And now it has turned again. But unfortunately, the right is still not paranoid enough. Most conservatives have not atoned for their full support of the Bush regime. And they are even challenging Obama to prove his toughness in foreign relations, to provoke hostilities with Iran, to maintain and expand the war on terror. Some go so far as to say that Obama will sell us out to the enemy – radical Islam. This particular paranoia is completely absurd, but they now think it possible that the U.S. government’s democratically elected leader would do something in foreign policy contrary to America’s interests. They worry about being censored in their dissent, but when others dissented from Bush’s policies that truly did harm America, they said the complaint was un-American. They want the freedom to condemn Obama for talking to Muslims, but when Bush’s wars empowered Iran and radicalized the Middle East, it was taboo to point it out. The conservatives have better instincts when they are out of power, but they still do not want to let go of their love of the warfare state. Even as they think Obama’s foreign policy might be a disaster, their main problem with it is it is not belligerent enough. And of course a Republican president would silence much of their criticism. The problem with rightwing paranoia is thus its inconsistency. If the right distrusted war as much as domestic socialism, and Republican power as much as Democratic power, its fears would not be far off base. Then again, in such circumstances, it would not really be the right anymore. From the Great Depression, to the stagflation of the seventies, to the current economic crisis caused by the housing bubble, every economic downturn suffered by this country over the past century can be traced to Federal Reserve policy. The Fed has followed a consistent policy of flooding the economy with easy money, leading to a misallocation of resources and an artificial "boom" followed by a recession or depression when the Fed-created bubble bursts. Abolishing the Federal Reserve will allow Congress to reassert its constitutional authority over monetary policy. The United States Constitution grants to Congress the authority to coin money and regulate the value of the currency. The Constitution does not give Congress the authority to delegate control over monetary policy to a central bank. Furthermore, the Constitution certainly does not empower the federal government to erode the American standard of living via an inflationary monetary policy. In fact, Congress' constitutional mandate regarding monetary policy should only permit currency backed by stable commodities such as silver and gold to be used as legal tender. Therefore, abolishing the Federal Reserve and returning to a constitutional system will enable America to return to the type of monetary system envisioned by our nation's founders: one where the value of money is consistent because it is tied to a commodity such as gold. Such a monetary system is the basis of a true free-market economy. 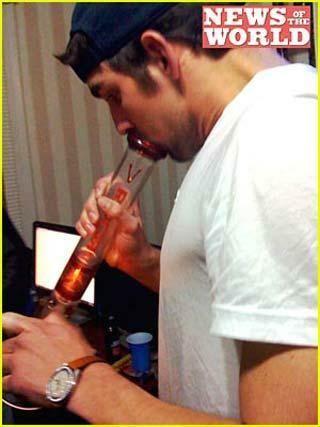 Add decorated Olympic swimmer Michael Phelps to the growing list of successful Americans who happens to indulge in marijuana during his down time. The tabloid news story is making international headlines, though it's difficult to understand why. After all, Mr. Phelps is hardly alone in his herbal inclinations. According to national and federal surveys, nearly one out of two Americans have tried weed, and among those age 18 to 25 – Phelps is 23 – pot smoking is especially popular. Contrary to the messages promoted by the federal government, marijuana consumers include people from all walks of life, ethnic classes, and socio-economic backgrounds. America’s current President said that he smoked marijuana regularly as a young man. Supreme Court Justice Clarence Thomas, former Vice President Al Gore, former Republican House Speaker Newt Gingrich, California Governor Arnold Schwarzenegger, and legendary astronomer Carl Sagan all have admitted using marijuana at different times during their lives. According to the U.S. government, most current marijuana users are gainfully employed. Statistically, most marijuana users are successful academically and financially. A National Bureau of Economic Research study even reported that marijuana use is associated with earning higher wages. Some former and current users, like Virgin tycoon Sir Richard Branson, Progressive Auto Insurance founder Peter Lewis, and New York State Mayor Michael Bloomberg are even multi-millionaires. Perhaps the public's fascination with this story is because Phelps is recognized as one of the most talented and successful athletes in the entire world. (He holds the record for the most gold medals won by any athlete in history.) But Phelps isn't an anomaly in this regard either. Many top athletes use cannabis off the field – noting that it helps them to relax after the excitement of sports competition and alleviate the pain from nagging injuries. It also won't leave them with a hangover or adversely impact their performance the next day. A 1997 New York Times investigation estimated that up to 70 percent of pro-basketball players occasionally indulge in the use of pot, and many high-profile football players – most notably Miami Dolphins star running-back Ricky Williams, former Dallas Cowboys all-star Mark Stepnoski, and even Super Bowl XLIII MVP Santonio Holmes – have spoken candidly about their off-field marijuana use. In fact, Phelps isn't even the first gold medalist to admit to smoking cannabis. That honor belongs to Canadian snowboarder and 1998 Winter Olympics gold medal winner Ross Rebagliati, who tested positive for having used cannabis in the days prior to his history-making performance. Sure, there will be some who will say that this latest chapter in Phelp's life is deserving of criticism because the 14-time gold medalist is sending a poor message to young children. And what message would that be? That you can occasionally smoke marijuana and still be successful in life. Well sorry if the truth hurts. Fact is, most Americans who use pot do so for the same reasons – and in the same manner – as do those who drink alcohol. According to a recent University of Alberta study, the majority of adults who use cannabis do so recreationally to "enhance relaxation." Researchers concluded: "[M]ost adult marijuana users regulate use to their recreational time and do not use compulsively. Rather, their use is purposively intended to enhance their leisure activities and manage the challenges and demands of living in contemporary modern society. Generally, participants reported using marijuana because it enhanced relaxation and concentration, making a broad range of leisure activities more enjoyable and pleasurable." No doubt Michael Phelps indulged in the use of marijuana for these very same reasons. He ought not to be condemned for it nor branded a criminal for his actions. For that matter, neither should anyone else. For the past eight years, George W. Bush has treated the White House much as Kenneth Grahame’s Mr. Toad treated a new automobile – like a shiny toy to be wrecked by racing the motor, spinning smoke from the tires, and smashing through farmyards until the wheels come off. Bush got to the Oval Office despite having lost the popular vote, and he governed with a fine disdain for democratic and legal norms – stonewalling congressional oversight; detaining foreigners and U.S. citizens on his “inherent authority”; using the Justice Department as a political cudgel; ordering officials to ignore statutes and treaties that he found inconvenient; and persisting in actions, such as the Iraq War, that had come to be deeply unpopular in Congress and on Main Street. Understandably, most Americans today are primarily concerned with whether Barack Obama can clean up Bush’s mess. But as Bush leaves the White House, it’s worth asking why he was able to behave so badly for so long without being stopped by the Constitution’s famous “checks and balances.” Some of the problems with the Bush administration, in fact, have their source not in Bush’s leadership style but in the constitutional design of the presidency. Unless these problems are fixed, it will only be a matter of time before another hot-rodder gets hold of the keys and damages the country further. The historian Jack N. Rakove has written, “The creation of the presidency was [the Framers’] most creative act.” That may be true, but it wasn’t their best work. The Framers were designing something the modern world had never seen – a republican chief executive who would owe his power to the people rather than to heredity or brute force. The wonder is not that they got so much wrong, but that they got anything right at all. At this point in history, I believe the opportunity presently exists for investing in the tools of liberty in combination with the ability to profit from the exchange. To any discerning, educated mind, the ability to purchase firearms and ammo could be rapidly coming to an end. FBI records indicate the National Instant Criminal Background Check System (NICS) experienced over 900,000 more requests (Form 4473) to purchase firearms in the last quarter of 2008 than the same period for 2007. This figure does not reveal the number of private purchases that occurred over the same period. This significant increase has created industry-wide shortages in several different firearm model offerings, predominantly in the so-called "assault weapon" categories. A friend who is employed by a sporting goods chain in a large Southwestern US city, told me a couple of days ago that his store received a shipment of 10 Rock River Arms AR-15, M4 firearms and they all sold in less than an hour. The flashing "Notice" sign at RRA’s website is indicative of the present demand for this product. I have found the Rock River offering to be the finest AR-15 platform available in this genre of weapons. While I am not a fan of the .223 round for self-defense, the weapons platform is an exceptional choice. Bushmaster, Stag Arms and DPMS are also very well constructed firearms in this category. The great advantage to the AR-15, M4 platform is the ability to switch calibers by simply switching upper receivers. My preference is the offering in .458 SOCOM, although several others are available. AK-47s in all models and styles have become increasingly popular and have seen an increase in price based on availability. My research shows that several American companies now producing AK’s have actually stopped taking orders for their products, simply being unable to keep up with the demand. I believe the 7.62x39 round to be much better suited for defense against man-sized targets than the .223 round. I know I will receive a large number of emails from folks who disagree with me on the above, but my past experience led me to this choice. I do not seek to change anyone’s mind that prefers the .223 round; I’ll use my choice, you use yours. A Springfield M1-A in .308 caliber is my weapon of choice in the so-called "assault weapons" category. It combines the dependability of operation inherent with the M1 Garand coupled with the convenience of a carbine version in the M1-A SOCOM. The .308 or 7.62X51 is a proven stopper on man-sized targets. I paid $500.00 for my very first M1-A; the same rifle now is almost $2000.00. I can assure you, considering the present political environment and demand by consumers; the price of these fine firearms will certainly see a substantial increase. When it comes to handguns, I am a 1911 guy, pure and simple. There is a reason this weapons platform has been around for almost 100 years; it works. The .45ACP round is a very effective round for putting a severe cramp on any criminal desires one might encounter. While I routinely joke with my friends about their "plastic pistols," in reality there are several excellent brands out there that are great choices, the Springfield XD being my first choice. While we could argue on and on about which caliber is best for personal defense, individual preference will vary. Choose the caliber you can handle best; 3 hits on target with a .22 LR are better than 6 misses with a .44 Mag. Wheelguns, or revolvers as they are better known, have seen a decline in popularity since the introduction of the high capacity semiautomatic pistol. I still consider the revolver to be the best choice for the new shooter owing to the simplicity of operation. I have a passion for the old Smith and Wesson blue steel revolvers in all calibers. Not as popular now due to most all models being produced in stainless steel, the older S&W revolver was manufactured when American craftsmen took pride in their work. My collection of these revolvers increase in value has far exceeded any 401K. Let us not forget what many consider the best self-defense firearm available today: the shotgun. It is really hard to argue with this logic, the primary disadvantage being the size of the weapon and the ability to bring it into play in tight quarters. The old scattergun brings a lot of firepower to the point of attack. Buckshot, depending on the gauge of the shotgun, throws out a significant number of projectiles, .24 to .36 caliber for each pull of the trigger. Many folks prefer the pump-action shotgun for its dependability, but my personal choice is the semi-auto. I prefer to present as small a target as possible to an adversary, and a pump action shotgun is extremely difficult to operate in the prone position. Whatever your choice might be, the purchase of a firearm(s) and/or a significant amount of ammunition in today’s political climate is a wise investment. I do not believe we will see a decline in demand or an increase in availability of either in the near or distant future. There will be a time, in the not so distant future, when a firearm with ammo will be worth much more than an ounce of gold. The upside to having a firearm and ammo is the firearm can be used to defend your gold against confiscation or theft. It has happened before you know. It is much better to have one and not need it, than to need one and not have it. As an investment, this product is worth much more than the fiat money required for purchase and it could possibly save your life, or the lives of your loved ones. The talk is all of stimuli and other matters economic – how do we re-inflate the balloon of American prosperity? Reality has taken a hat-pin to it, and trillions have gone up in the smoke of foreclosed mortgages and credit-default swaps. Panaceas are not lacking. Paul Krugman says it doesn't matter what we spend our money on, as long as we throw it away rapidly and without forethought. I have no doubt that soon we'll be hearing the ghost of Huey Long promising "Every man a king!" I fully expect the Townsend Plan to come back at some point, along, perhaps, with a revival of interest in pre-Leninist forms of Marxism. Along these lines, President Obama and his party have come up with a "stimulus package," and I must pause to remark how important language is to these people. It's a "package," you see, just like a Christmas gift, only better, because they, the politicians, get to play Santa Claus and shower their constituents with presents. This legislative larceny is predicated on the oddly counterintuitive notion that we can and should spend our way out of poverty – that the sins of our profligacy can be forgiven if only we indulge in yet more ravenous forms of gluttony. To ordinary Americans, this kind of Washington-think is wholly alien: it is Bizarro economics. After all, when normal human beings are in financial trouble they cut back on their spending, as they are doing now. The American polity, in its younger days, would naturally apply the same logic to government, but, in our dotage, we impart magical powers to the organs of the state, which can produce wealth out of thin air, with only the aid of a printing press. Oh, yes, we understand – albeit vaguely – that this is debt for future generations to pay. Yet we recall – even more vaguely – old bromides like "We owe it to ourselves," which are embedded in our collective memory like flies in amber, and we are reassured. Israeli expansionists, their intentions to take full control of the West Bank and the Gaza Strip and permanently keep the Golan Heights of Syria and expand into southern Lebanon already well known, also have their eyes on parts of Iraq considered part of a biblical “Greater Israel”. Israel reportedly has plans to relocate thousands of Kurdish Jews from Israel, including expatriates from Kurdish Iran, to the Iraqi cities of Mosul and Nineveh under the guise of religious pilgrimages to ancient Jewish religious shrines. According to Kurdish sources, the Israelis are secretly working with the Kurdistan Regional Government (KRG) to carry out the integration of Kurdish and other Jews into areas of Iraq under control of the KRG. Kurdish, Iraqi Sunni Muslims, and Turkmen have noted that Kurdish Israelis began to buy land in Iraqi Kurdistan, after the U.S. invasion in 2003, that is considered historical Jewish “property”. The Israelis are particularly interested in the shrine of the Jewish prophet Nahum in al Qush, the prophet Jonah in Mosul, and the tomb of the prophet Daniel in Kirkuk. Israelis are also trying to claim Jewish “properties” outside of the Kurdish region, including the shrine of Ezekiel in the village of al-Kifl in Babel Province near Najaf and the tomb of Ezra in al-Uzayr in Misan Province, near Basra, both in southern Iraq’s Shia-dominated territory. Israeli expansionists consider these shrines and tombs as much a part of “Greater Israel” as Jerusalem and the West Bank, which they call “Judea and Samaria”. Kurdish and Iraqi sources report that Israel’s Mossad is working hand-in-hand with Israeli companies and “tourists” to stake a claim to the Jewish “properties” of Israel in Iraq. The Mossad has already been heavily involved in training the Kurdish Pesha Merga military forces. Reportedly assisting the Israelis are foreign mercenaries paid for by U.S. Christian evangelical circles that support the concept of “Christian Zionism”. Iraqi nationalists charge that the Israeli expansion into Iraq is supported by both major Kurdish factions, including the Patriotic Union of Kurdistan headed by Iraq’s nominal President Jalal Talabani. Talabani’s son, Qubad Talabani, serves as the KRG’s representative in Washington, where he lives with his wife Sherri Gabrielle Kraham, who is Jewish. Also supporting the Israeli land acquisition activities is the Kurdistan Democratic Party, headed by Massoud Barzani, the president of the KRG. One of Barzani’s five sons, Binjirfan Barzani, is reportedly heavily involved with the Israelis. The Israelis and their Christian Zionist supporters enter Iraq not through Baghdad but through Turkey. In order to depopulate residents of lands the Israelis claim, Mossad operatives and Christian Zionist mercenaries are staging terrorist attacks against Chaldean Christians, particularly in Nineveh, Irbil, al-Hamdaniya, Bartalah, Talasqaf, Batnayah, Bashiqah, Elkosheven, Uqrah, and Mosul. These attacks by the Israelis and their allies are usually reported as being the responsibility of “Al Qaeda” and other Islamic “jihadists”. The ultimate aim of the Israelis is to depopulate the Christian population in and around Mosul and claim the land as biblical Jewish land that is part of “Greater Israel.” The Israeli/Christian Zionist operation is a replay of the depopulation of the Palestinians in the British mandate of Palestine after World War II. In June 2003, a delegation of Israelis visited Mosul and said that it was Israel’s intentions, with the assistance of Barzani, to establish Israeli control of the shrine of Jonah in Mosul and the shrine of Nahum in the Mosul plains. The Israelis said Israeli and Iranian Jewish pilgrims would travel via Turkey to the area of Mosul and take over lands where Iraqi Christians lived. In my research into central banking, the World Bank, and so forth I came across some information that's extremely interesting, given the current state of world affairs. The Rothschild family owns Bank of America (the world's largest bank) and the Rockefellers own Chase Manhattan and J.P. Morgan Chase (America's largest banks under BoA). The Rothschilds own a majority share in the Bank of England (the UK's central bank) and have controlling shares in Europe's central banks. Both the Rockefellers and the Rothschilds have large controls (through central banks) of the IMF and their World Bank. In the entire world, only a handful of countries can be noted that don't have IMF or Rothschild-controlled central banks. These are known to George W. Bush's fans as the "Axis of Evil"... North Korea, Syria, Lebanon, Iraq, Iran, Afghanistan, Cuba, Venezuela (which recently paid off its debt and pulled out of the World Bank/IMF)... See a trend? If Fox News hates them, they're probably not a member of any central bank controlled by the Rothschilds. Of that group, Iraq is now under a newly-established central bank modeled on the European Central Bank (aka Bank of England) and Afghanistan is revamping theirs to match. So they can be struck from the list, leaving only half a dozen more to be conquered. The Palestinians, it should be noted, have basically no banking at all thanks to their having very little in the way of economy--most of their money on the streets is actually Egyptian currency, though barter is the general way of things. Also note that under Islamic law, usury is immoral and forbidden, therefore the interest-loan-basis of most central banks is not legal under Islamic law. Yet another reason for the ruling families to hate Islam, since usury is the very basis of their debt-on-debt system of control. So the point is: watch the nations which have no central bank controlled by the Big Boys and you can point your finger at which nations will be attacked in the near future, either by US or by another major military power--perhaps China, which will need an excuse to spend its over-abundant money reserves and production capacity once the US market starts going too dry for them. Happy days are here again – not for America, but for meddlers promising to scheme the nation out of the doldrums. Ideas that would have been derided during the presidencies of Bill Clinton (“the era of big government is over”), George H.W. Bush (“A president…. must see to it that government intrudes as little as possible in the lives of the people”), and Ronald Reagan (“government is not the solution to our problem; government is the problem”) are now de rigueur. That those presidents were unfaithful to their rhetoric does nothing to blunt the sense that they strode the stage during a different act. America has again crossed a Rubicon. Not since the Great Depression have cranks had the ear of the nation as they do now. The “new” New Deal recidivism reveals a sclerotic movement stuck in the past. The ubiquitous prefix “new” stamped on any old program reflects the movement’s horror that its ancient pedigree might be discovered. What self-respecting “progressive” xeroxes the past to boldly remake the future? The old New Deal was a mish-mash of the populist, progressive, and social gospel movements that antedated it. If the New Deal’s abandonment of the gold standard did not spark flashbacks to William Jennings Bryan, and its National Recovery Administration did not immediately bring Woodrow Wilson’s War Industries Board to mind, then its very name should have jogged memories. The Madison Avenue-style marketing ploy, an amalgamation of Woodrow Wilson’s “New Freedom” and Theodore Roosevelt’s “Square Deal,” served as a clue to the atavistic nature of the New Deal. The “new” New Deal, then, recycles a 75-year-old political gimmick that, even when first unveiled, was stale.